Prominent attorney Fred Smith, QC, has hit out at the announcement that there may be no Freedom of Information Act brought to Parliament until 2016, saying the legislation is already long overdue and accusing government of stalling in an effort to avoid increased public scrutiny. 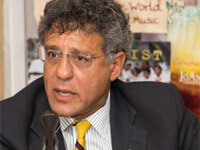 Smith, the legal director of fast-growing social and environmental advocacy group Save The Bays, which has campaigned energetically for the enactment of an FOIA, noted that the Progressive Liberal Party (PLP) promised to enact the legislation during the 2012 campaign but has failed to live up to that pledge. “It is simply unacceptable,” Smith said. “Five years after the election promise and on the eve of the new election is far too long for the public to wait for transparency and accountability in government. Smith was responding to the announcement by Minister of Education Jerome Fitzgerald that following his government’s withdrawal of an FOIA passed just before the 2012 election by the former Free National Movement (FNM) administration, a revised version will not be presented to Parliament before spring 2016. “Again, just like the FNM, they are kicking the can down the road, pushing the matter to the end of their term so as to avoid increased public scrutiny of their own actions and make FOIA the problem of their successors,” he said. “It’s no wonder they are stalling – think of how many important public issues have arisen on the PLP’s watch that an FOIA could shed considerable light on. Smith said of particular concern to STB is the ongoing practice of governments forging secret deals with foreign developers that often lead to significant environmental degradation and social dislocation. “The scourge of unregulated development has its roots in the lack of transparency and accountability. The public should know what the government has agreed to in its name, and should always have a say on what is done with its Crown land and natural resources. Smith said Fitzgerald’s distain for the public was evident in his claim the delay is necessary as government is still in the process of deciding whether it should make the “over 100” amendments to the FNM’s Act, or “scrap it” and start it from scratch. “And where exactly did they come up with these 100 amendments? With whom did they consult? Are they suddenly free speech experts? “The public has a right to an open discussion on this matter in which advice and recommendations can be submitted by interested groups and individuals. Clearly, they don’t have any respect for the citizens of this country, or for their sacred right to open and transparent government,” he said. Meanwhile, Smith said, the rest of the world clearly does understand the urgent need for FOIA in The Bahamas. “Earlier this year, the government’s own tax reform consultants from New Zealand insisted the legislation was crucial for the implementation of Value-Added Tax, slated for January 2015. And, the new US Embassy Charge d’affaires threw support behind FOIA in The Bahamas and pledged her country’s help to see it in place, a pledge the administration has yet to even acknowledge,” he said. Launched just over a year ago, Save The Bays has taken The Bahamas by storm. Begun as an effort to bring and end to the scourge of environmentally destructive unregulated development, the grassroots movement quickly mushroomed to incorporate a variety of other civic and social justice concerns and grievances as other advocacy groups flocked to STB’s banner. In June, a pro-FOIA rally in Rawson Square organized by STB attracted 20 different organizations, together representing more than 60,000 people with diverse concerns ranging from environmental destruction and government corruption, to labor disputes and human rights abuses. The grassroots effort now has more than 500 registered members, 17,000 followers on Facebook and 6,000 signatures on its petition calling for an Environmental Protection Act, an FOIA and an end to unregulated development in The Bahamas.